A powerhouse team, through and through. At the All-Star break it is clear the Yankees, Astros, and Red Sox are the three best teams in baseball. Order them however you want. Those three stand out from the other 27 clubs. The 2018 Yankees: They’re good, folks. Really good. Great, in fact. The 2018 Yankees have a rookie manager in Aaron Boone, who came into the season about as inexperienced as possible. Yeah, he played for a while and comes from a baseball family, though he’d never coached or managed at any level. Boone went from player to broadcaster to 2018 Yankees manager. It was a risky decision for a team with World Series aspirations. Evaluating a manager is so incredibly difficult — remember the days when we used to look at the difference between actual record and expected record based on run differential, and pin that on the manager? — because the most important part of their job happens behind the scenes, either in the clubhouse or on the team plane or at home. It’s not just an X’s and O’s gig. Because of that, I’m not going to bother to slap a grade on Boone as part of our midseason review like we have with the players. Instead, I’m just to pass along some thoughts and observations about the new skipper as the Yankees prepare to head into the second half. 1. Last week was a bad week. Might as well start here. Last week was Boone’s worst week as a manager in terms of on-field decisions. 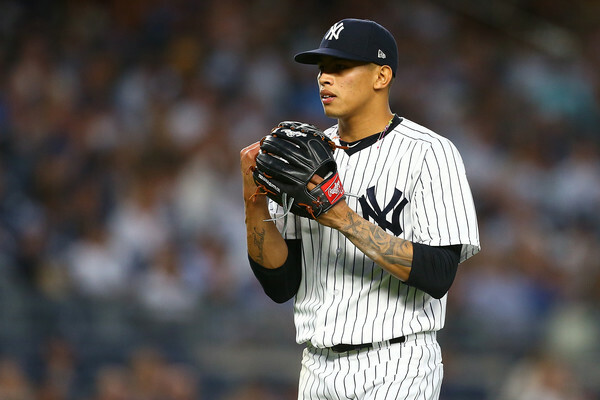 He got burned trying to steal outs against the Orioles with CC Sabathia and Masahiro Tanaka, who were clearly running on fumes and were left in long enough to give up big home runs. Ditto Chad Green, who was also left in too long against the O’s and Indians and got burned because of it. 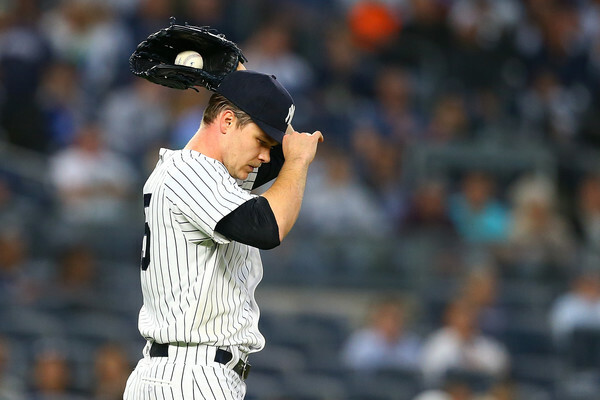 There was also the decision to save pinch-hitter Brett Gardner for two outs in the ninth rather than use him to hit for Kyle Higashioka, who was allowed to face Zach Britton with a runner on third and one out with the Yankees down a run. (He struck out.) There’s also the whole “not giving runners the red light when Giancarlo Stanton is at the plate in a close game” thing that has burned the Yankees several times. Just let the man hit with men on base! Last week was Boone’s worst week in terms of obvious managerial decisions (leaving a pitcher in too long, etc.) that didn’t work out. There have been other instances like that this year where the decision did work out — I remember Sabathia being left in to get the final few outs against the Braves a few weeks ago when he was on the ropes, but he got the outs — so we all kinda forgot about them. Last week, they came back to bite the Yankees. 2. There hasn’t been a radical shift in on-field strategy. 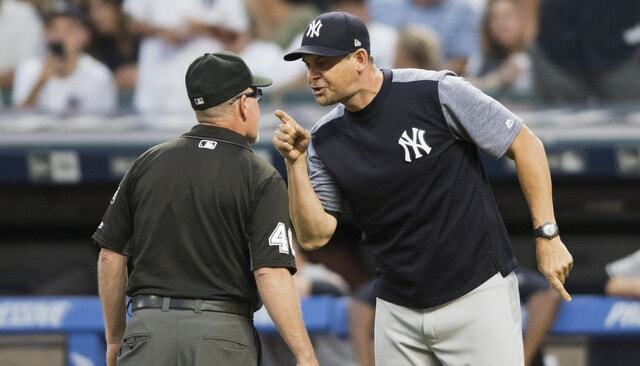 If you didn’t know any better, it would be hard to look at the on-field decisions and tell whether Boone or Joe Girardi was the manager. Like Girardi, Boone has a set seventh (Green) and eighth (Dellin Betances) inning guy in the bullpen. He doesn’t like lefties (or righties) hitting back-to-back in the lineup. 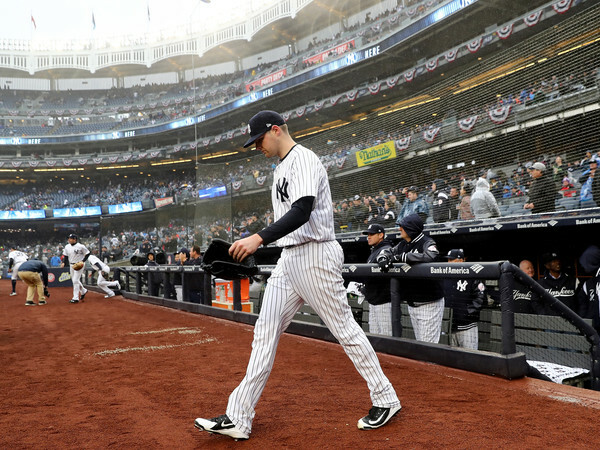 He’s not a fan of bunting and, despite statements to the contrary in Spring Training, he’s not opposed to letting a pitcher (Sonny Gray) have a personal catcher (Austin Romine). The on-field decisions are generally similar and it’s either because a baseball manager can only do so much to impact a game, or because so many shots are called from the front office. Or both. The Yankees are a very analytical organization and I’m not sure whether directives have been handed down, though I do know information is provided for Boone and the coaching staff. Perhaps that information has led to Boone making similar decisions as Girardi. Point is, there doesn’t seem to be a big difference between the two in terms of their on-field strategy. Mickey Callaway, Mets: Gave the umps the wrong lineup card and batted out of order. 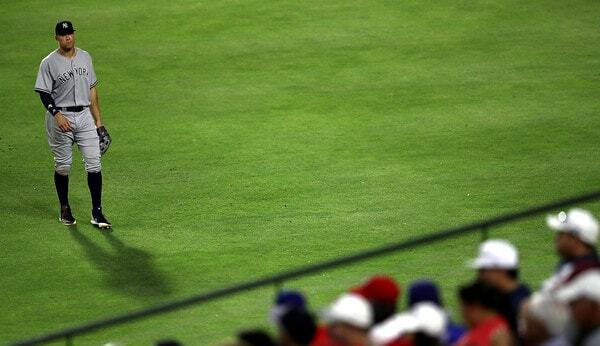 Gabe Kapler, Phillies: Forgot to warm up a reliever before taking out his starter. Dave Martinez, Nationals: Changed pitchers before the pinch-hitter was announced and lost the platoon advantage. That’s really bad! Managing 101 stuff, like I said. It’s a low bar, I know, but Boone hasn’t done anything like that so far. Callaway in particular seems in over his head — last week he changed his pitcher before the pinch-hitter was announced a la Martinez — and we haven’t seen anything like that with Boone yet. Bad pitching or lineup decisions are whatever. Everyone does that. The basic stuff? No issues there. 4. He’s great with the media. And that’s not nothing. Boone is a natural with the media — surely his time as a broadcaster helps with this — and he’s quite good at diffusing potential controversies. Remember when Aaron Judge got thrown out trying to steal with Stanton at the plate against the Indians last week? After the game Boone said he second guessed himself, he screwed up, and that was it. End of the story. 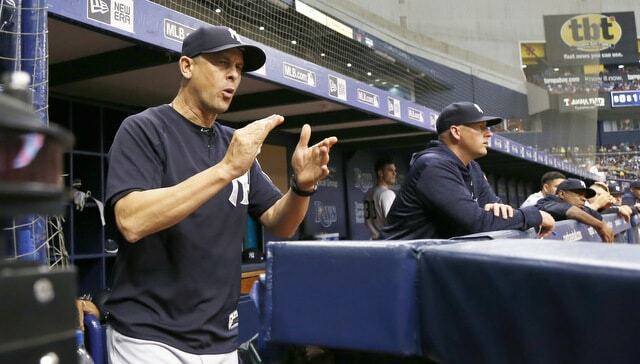 Girardi could be a little stubborn with the media and it created some unnecessary headaches. Remember the non-challenge in the ALDS? After the game Girardi wouldn’t admit the mistake and his excuse was he didn’t want to throw off his pitcher’s rhythm with a challenge. Only digging a deeper hole with an excuse like that. Boone is much more personable and much more adept at diffusing any problems with the media. It’s a very Joe Torre-esque quality. 5. So what happens when the intensity increases? Let’s be real here, the players have made Boone’s job incredibly easy so far this season. 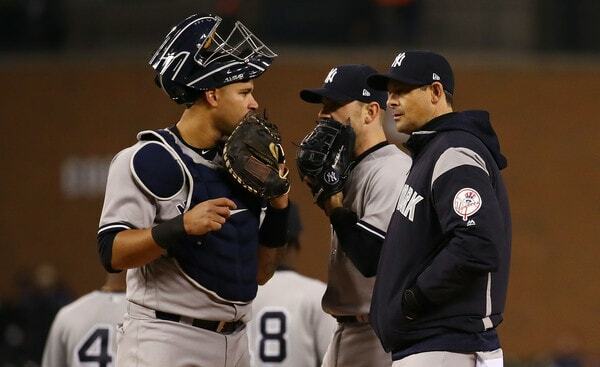 The Yankees have not experienced anything close to a crisis. Their worst stretches this year are .500 ball. They haven’t had that ugly 3-9 stretch where the sky starts falling, you know? The players have made the first 95 games of Boone’s managerial career very easy. Going forward though, the games will become more important and more intense as the postseason race heats up, and we don’t know how Boone will react in that environment. He seems to be the exact opposite of Girardi. Girardi was very intense and high strung, and hey, that can work. It did work for a long time. Boone is pretty much the opposite. He’s very even-keeled and relaxed, and I think that is reflected in the team. 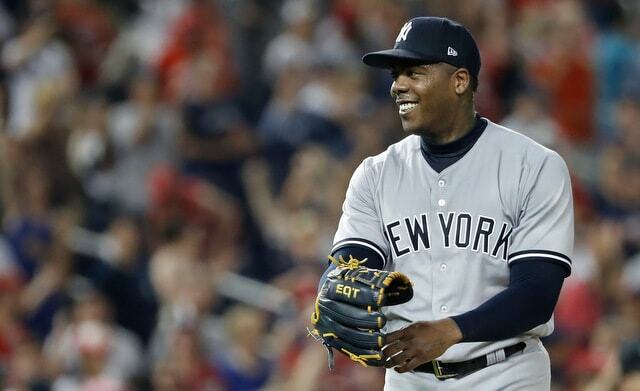 The Yankees seem much more loose this year than they have the last few years. The manager sets the tone. Will that change as we get deeper into the postseason race? Who knows. Boone’s never managed and we’re not going to know how he handles those pressure situations until the team actually plays in those situations. Hasn’t happened yet. I think Boone will be fine. His big thing is staying in command and controlling emotions. I’d be surprised if, coming September when a postseason spot is on the line, we see Boone with that strained look on his face like Girardi. The Yankees are so good and so talented that Boone’s single biggest job is don’t screw it up. Give your best hitters the most at-bats, use Green and Betances and Aroldis Chapman in the late innings of close games, and things’ll be fine. Keep everyone happy and make sure there isn’t a mutiny in the clubhouse. That is the Boone’s single most important responsibility, and he’s done that. So far, so good, though a postseason race remains uncharted territory for the new manager. It’s not an elite group, to be sure – but it’s nonetheless a strength when a pitching staff is average across the board. And it’s especially nice to see for a team that purportedly tried and failed to improve throughout the off-season, and remains ever-vigilant as the trade deadline approaches. Let’s take a look at how the individual parts measure-up. It would be easy to look at German’s numbers as a starter and settle on an ‘F’ for his grade. There are several ugly peripherals in those 63.1 IP, including a 5.97 ERA (6th worst among starters with at least 60 IP), 4.58 FIP, and 1.71 HR/9, and he has failed to make it out of the fifth in three of his last four starts. That’s not great, Bob. But we’re grading relative to expectations here, and I don’t think the expectations for the team’s 6th or 7th starter were all that high. Moreover, there are a lot of positives hidden in German’s season, too. His 26.6% strikeout rate is well above-average, his 8.4% walk rate is right around average, and his 41.7% groundball rate is right there, too. He’s also authored five quality starts (in twelve chances), and had another two that were just shy of that not-so-lofty standard. Does that make up for his five starts that ranged from “bad” to “awful?” Not at all. But I do think that the combination of his slot on the depth chart, strong peripherals, and fifty-fifty shot of giving the team an adequate outing brings him above the standard of a failure. Going forward, there are two things to pay attention to with German. The first is simple: his velocity. 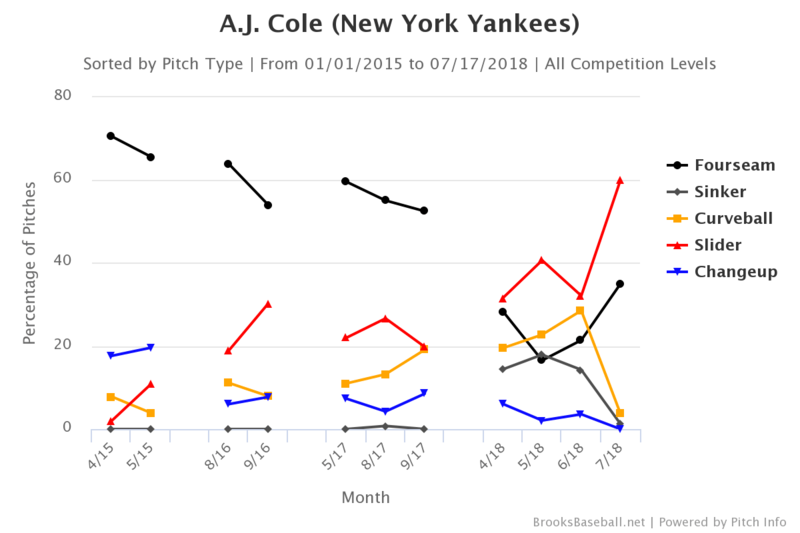 He has lost about 2 MPH off of his fastball from the beginning of the season, which isn’t too shocking as he spent the first month in the bullpen. 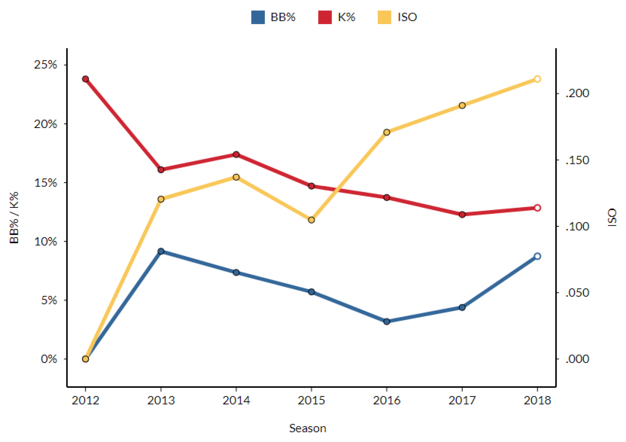 At the same time, though, he’s lost just over 1 MPH since he first joined the rotation on May 6 – and fastball velocity tends to increase as the season goes on and the weather warms up. It’s not necessarily a concern at this point, but it’s there. The other is German’s pitch use in general. Fastballs (his four-seamer and sinker) represented 40.6% of his offerings in May, 47.6% in June, and 55.9% so far in July. 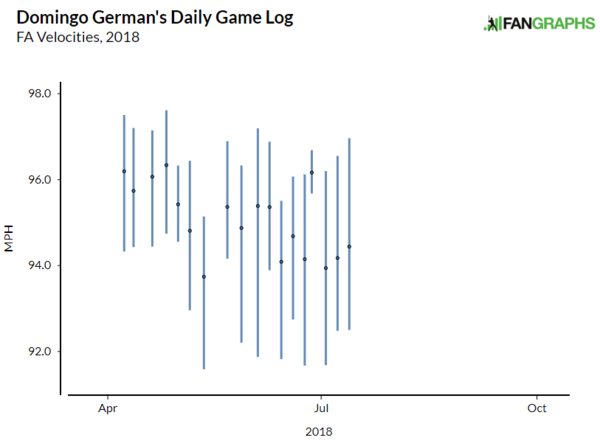 With his velocity backing up a bit and three of his last four starts being bad, German’s pitch selection may well be an issue. I was excited when the Yankees swung their deal for Gray last July, as a long-term believer in his approach, stuff, and resume. And I was certain that he was going to come into 2018 looking more like the pitcher that they dealt for (that is, the guy we saw with the A’s in the first-half) than the nibbler that the Yankees received. Unfortunately, that hasn’t happened, and Gray is sitting on a 5.46 ERA (88th out of 92 pitchers with 90-plus IP). There really isn’t a positive way to spin Gray’s season to-date, either. He has seven quality starts in eighteen outings, and has failed to make it out of the fifth seven times. He’s allowed four-plus runs eight times, and he’s just barely averaging 5 IP per start – both of which make him a larger drain on the bullpen than the other starters. 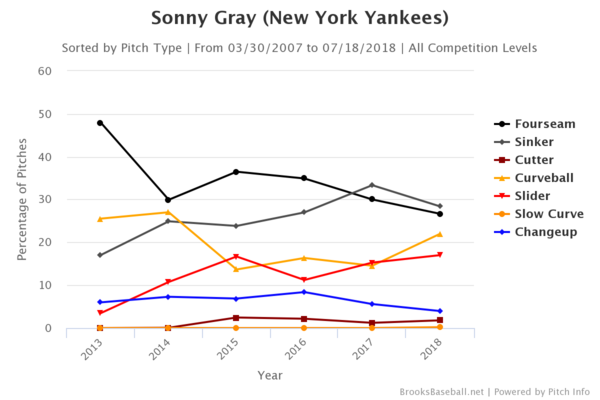 Gray may not be the worst starter in the league right now, but he’s fairly close when you focus on pitchers who have been in the rotation the entire season. If I had to hazard a guess at the cause of this, I would focus on his pitch selection. Or, perhaps more accurately, the anti-fastball approach of the Yankees in general. 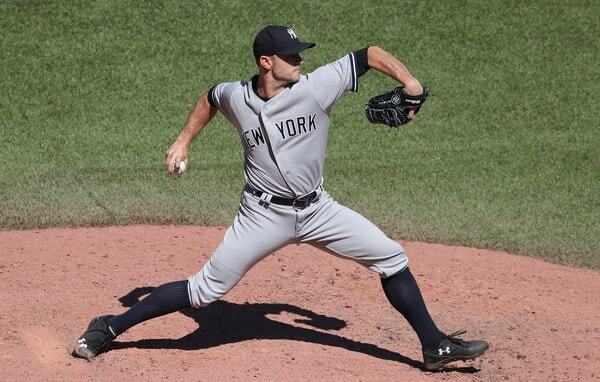 Gray is throwing fewer four-seamers than ever before, and more curves and sliders. From 2014 through 2017, he averaged about 35% four-seamers and 30% breaking balls; in 2018, those numbers are 26.7% and 39%, respectively. That’s a fairly drastic change of approach, and that sequencing could undoubtedly cause issues. At least he ended the first-half on a high note. That’s a thing of beauty, isn’t it? It was short-lived, though, as he had to have a cortisone shot in his shoulder, and is currently shut-down. We knew that he was on some manner of innings limit, considering that he didn’t pitch at all in 2014 or 2015 due to injuries, and tossed a combined 35.0 IP between 2016 and 2017 around Tommy John surgery – but seeing him go down with shoulder inflammation isn’t what you want. 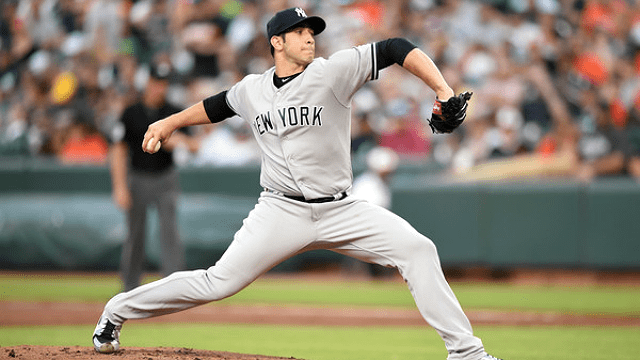 The Yankees were only able to enjoy six starts from Montgomery this year, as the 25-year-old underwent Tommy John surgery in June. Those six starts were 27.1 innings of 3.62 ERA ball, which is quite good … but that’s all that they’ll get from him until sometime next Summer. If you’re looking for some semblance of a silver lining here, it is worth noting that Montgomery had no prior injury history of note, and they didn’t play the waiting game with rest and rehabilitation. Surgery isn’t great, to be sure, but if it’s a necessity, sooner is better than later. Is an ‘A’ somewhat aggressive here? Maybe. 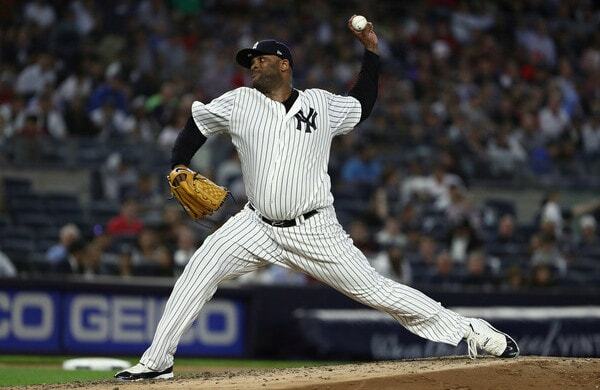 But it’s difficult to be anything other than impressed by how successful Sabathia’s reinvention has been. His 3.51 ERA is his lowest since 2012, and he has held the opposition to three or fewer runs in 66% of his starts. 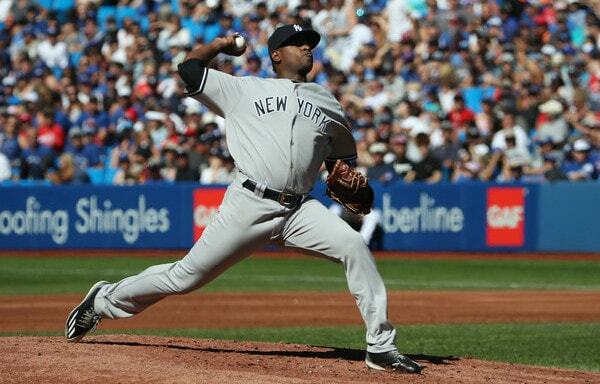 With the exception of Luis Severino, no Yankees starter has kept the team in a better position to win than Sabathia. 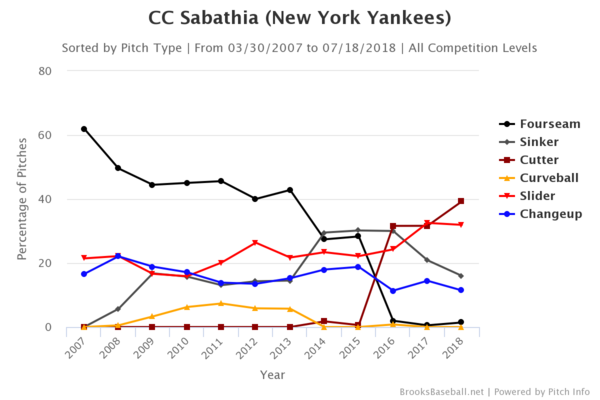 Sabathia has all but eliminated his four-seamer at this point in his career, and he’s also throwing his sinker far less often this season. As per Brooks Baseball, there have been eleven starts in which Sabathia hasn’t used a single four-seamer, including his last four outings. Cutters and sliders make up more than 70% of his offerings, and that mix was worked wonders thus far. The All-Star break was well-timed for the soon to be 38-year-old, as he has scuffled in his last two starts. He’ll have nine days of rest by the time he gets the call, and he has thrived on extra rest this year, posting a 1.59 ERA in his six starts with six-plus days of rest. At his age, it would make sense for the Yankees to continue to give him as much extra rest as possible; whether or not they’re able to is the question. 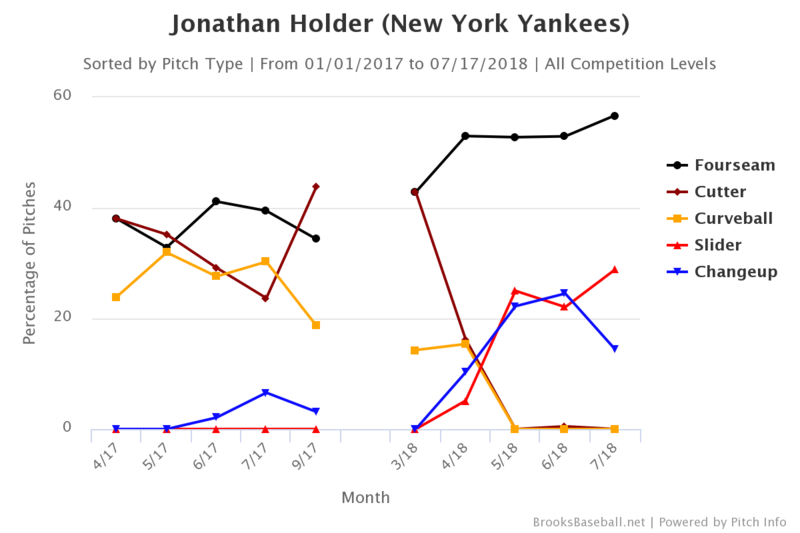 In addition to those lofty placements, he has also completed at least five innings in all twenty starts, and has only allowed more than three runs twice. He’s a bona fide ace, through and through. Severino did stumble into the break a bit, allowing 7 runs in his last two starts of the half, so he’ll almost certainly appreciate the extra rest afforded by the break. His next start isn’t until July 23, so he’ll have had ten days of rest (not including the All-Star game) when he takes the mound. I’m so glad that he’s a Yankee. Last year was by far the worst of Tanaka’s short career, but it can be split up into manageable sample sizes. 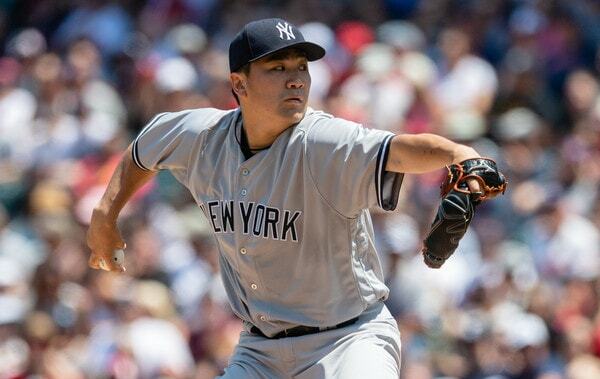 His ERA sat at 6.34 on Father’s Day last year, and fans were beginning to loudly wonder if the team would be better off with Tanaka opting out. And then a switch went on, and he was great the rest of the way. From June 23 through the end of the season, Tanaka pitched to a 3.54 ERA in 101.2 IP, with very good peripherals. That success carried over into the playoffs (and then some), as he posted a microscopic 0.90 ERA in 20 IP. And then the calendar flipped to 2018, and the wheels fell right back off. 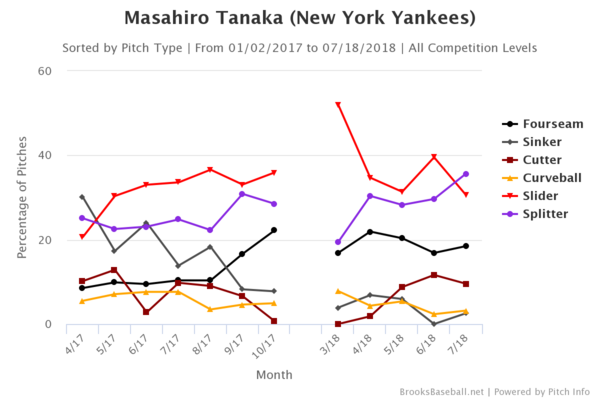 In addition to his 4.54 ERA (which is a tick below-average, translating into a 95 ERA+), Tanaka has bottomed-out in walk, ground ball, and home run rates, posting career-worsts across the board. His 4.90 FIP is the worst of his career, too. Now, to be fair, he’s not as bad as he was in the first half of 2017 – so there’s that. The problem with Tanaka is easily identified – his propensity for home runs. He’s allowing more fly balls than ever this year, which means he’s allowing gopher balls at a career-worst pace of 1.94 per 9 innings. That’s the fifth-worst home run rate in the game, and that’s why he’s allowed 18 bombs in just 83.1 IP. And, for the sake of comparison, every pitcher that has allowed more has also thrown at least 18 additional innings. Could that have something to do with his gopheritis? Perhaps. I was almost inclined to go with an ‘F’ for all of this, but Tanaka has at least given the Yankees some length in his starts, and he’s a league-average-ish starter. That’s not what you want from a pitcher on his contract, but he hasn’t been a straight-up dud like Gray. On the position player side of things, the outfield has been the biggest strength for the 2018 Yankees so far this season. The team’s outfielders have combined for a .261/.353/.480 (123 OPS+) batting line and they rank fourth in baseball in OBP, second in SLG, and second in OPS+. They’re also third with +26 DRS and second with a +15.1 UZR. The outfield ranks near the top of the league in offense and defense. Pretty great. Let’s review the outfield’s first half. Consistency is boring. Consistency is Brett Gardner. Year in, year out Gardner provides the same level of on-base ability and defense, and that has been true again thus far in 2018. He’s also provided several big hits this season, most notably his go-ahead triple against the Red Sox, game-tying homer against the Astros, and go-ahead homer against the Mets. By WPA, three of the team’s six biggest hits of the first half came off Gardner’s bat. 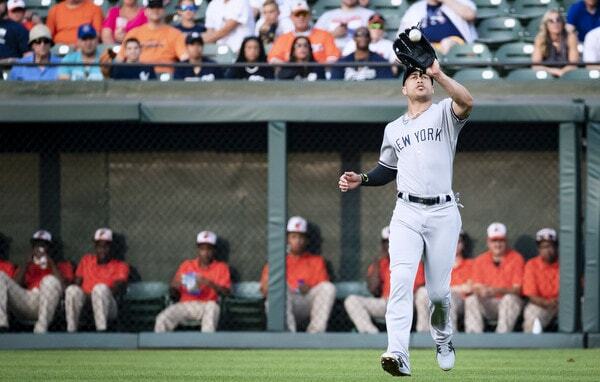 As indicated back in Spring Training, Aaron Boone has cut back on Gardner’s workload this season. 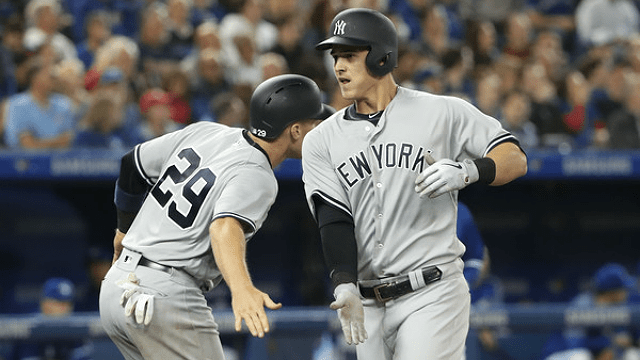 Gardner, despite being the regular leadoff hitter, has only the fourth most plate appearances on the team, and he’s on pace for 628 plate appearances on the season. That’s after averaging 706.5 plate appearances per 162 games from 2014-17. Gardner is seeing less time against lefties and less time overall. Boone said he’d try to get Gardner more rest and he has. And, with Gardner set to turn 35 in August, I am totally on board with this plan. 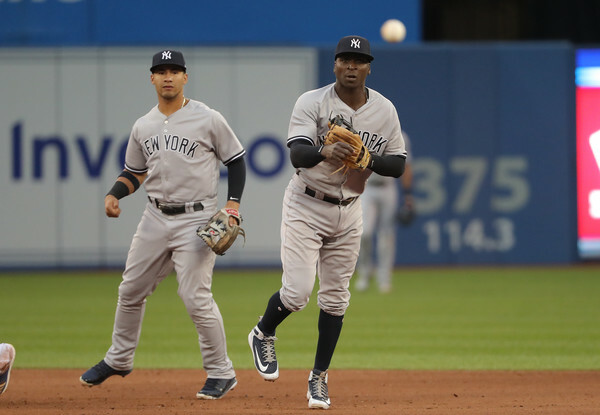 The Yankees have four viable everyday outfielders, which makes rotating them a breeze. Gardner is not the Yankees best player, though he is a heart and soul player who really sets the tone from the leadoff spot. Keeping him fresh and productive should be a priority and it has been to date. Gardner’s been great. Same guy he’s always been, and that is a-okay with me. 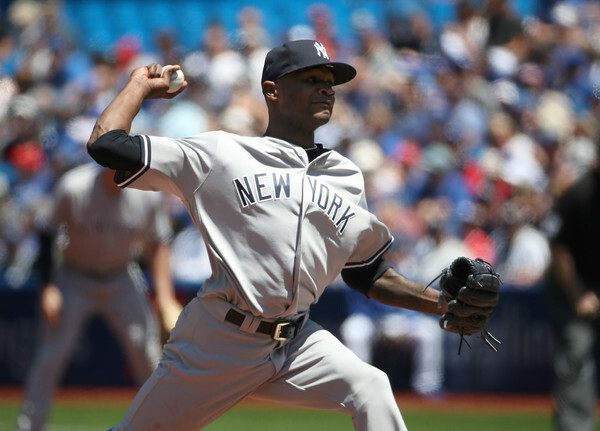 Hicks is a tough one to grade because what were the expectations coming into the season? There were reasons to be skeptical about his 2017 performance given his career to date, though the high-end tools are fairly obvious. Hicks is a great athlete, he’s a switch-hitter with tremendous plate discipline, and he’s a very strong defensive center fielder. But he never did anything like what he did last year. How many people expected him to do it again? Last season Hicks started hot and finished slow and hurt. This year he started slow and hurt before getting hot. 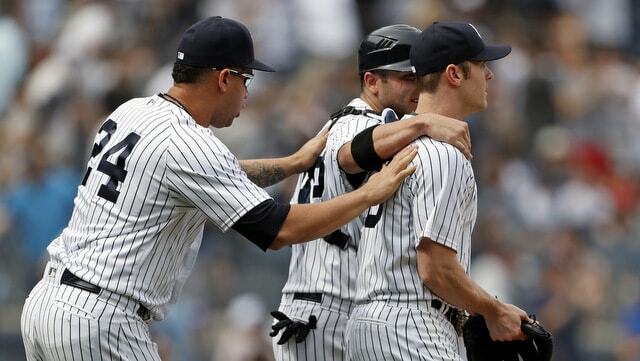 Hicks strained his intercostal on Opening Day, the very first game of the season, and he missed about two weeks. Then, once he returned, it took some time to get going. Hicks did hit .273/.367/.564 (152 wRC+) with 13 homers in his final 200 plate appearances of the first half. That, my friends, is star level production. Among full-time center fielders only the great Mike Trout and slightly less great Lorenzo Cain have Hicks beat in WAR this season. WAR of course is not the be all, end all stat, but it shouldn’t be discarded either. Point is, Hicks is a comfortably above-average player on both sides of the ball. Very good offense and very good defense. He’s a former first round pick and highly regarded prospect — Baseball America ranked him 19th on their 2010 top 100 list — who’s put it all together. Hicks is not starting to put it together. He’s put it together. It’s happened. I feel like a B+ is a tough grade but I’m going to stick with it. Judge has been objectively awesome this season. He just hasn’t been as awesome as last season, which was truly one of the greatest rookie seasons in baseball history. It was the greatest power hitting season by a rookie in baseball history. Judge set the bar awfully high last year and he hasn’t quite returned to that level this year. That said, Judge has been great this year. He went into the All-Star break with a .276/.392/.544 (155 wRC+) batting line with 25 home runs. Judge is third in baseball in home runs and, among the 164 hitters with enough plate appearances to qualify for the batting title, he is 13th in OBP, 12th in SLG, and ninth in wRC+. Add in above-average right field defense and both the FanGraphs (+4.5) and Baseball Reference (+5.0) versions of WAR rank him as a top five position player in 2018. Pretty great. For whatever reason — and I have no idea what the reason(s) is — Judge has significantly higher ground ball (47.3% vs. 36.4%) and pull (48.2% vs. 35.5%) rates on the road than at home, which certainly helps explain the difference in production. He’s hitting the ball in the air and to all fields at home. On the road, he’s been a left field hitter who hits a lot of balls on the ground. A few weeks ago I noticed teams were pounding Judge inside with fastballs, leading to more pulled grounders, but why would that be limited to the road? Maybe the Yankees have an elaborate sign-stealing system at home that explains Judge’s production. That’d be quite the story. Then again, if that is the case, why don’t other Yankees have huge home/road splits? 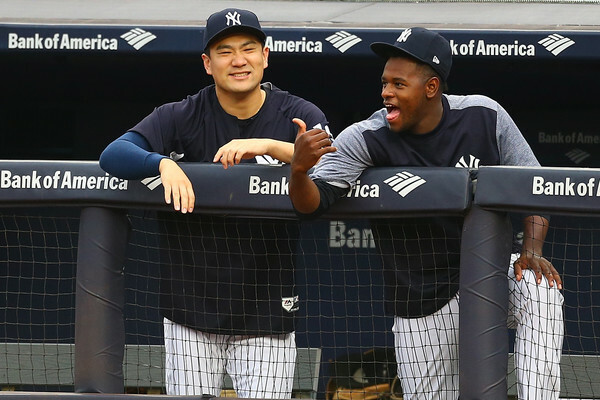 The team’s next largest home/road split is Didi Gregorius at +45 wRC+. No one else is above +10. Part of me wonders whether Judge has duped himself into thinking the short porch is the only way he can hit opposite field dingers, so he’s trying to compensate by pulling everything on the road. That sounds kinda silly. He can hit the ball out in any direction in any park. It is also possible Judge’s home/road woes are sample size noise. And hey, that might apply to last year. Maybe this is the real Aaron Judge away from Yankee Stadium and last year was the anomaly. I’d bet against it, but you never know. Whatever it is, it sure would be rad if Judge figured it out in the second half. For now, he was great in the first half. Not as great as last year, but still great. It still feels like Judge has more to give because of his road woes, though maybe that’s an unfair expectation on my part. Stanton is sitting on a .278/.346/.518 (133 wRC+) batting line with 23 home runs overall — he’s on pace for 40 home runs and +5 WAR — and, since May 1st, he’s hitting .298/.361/.558 (147 wRC+). Giancarlo career: .269/.359/.551 (143 wRC+). Giancarlo since May 1st: .298/.361/.558 (147 wRC+). Aside from a little more batting average these last few weeks, Stanton has been hitting like he has his entire career to date, which is borderline MVP caliber. 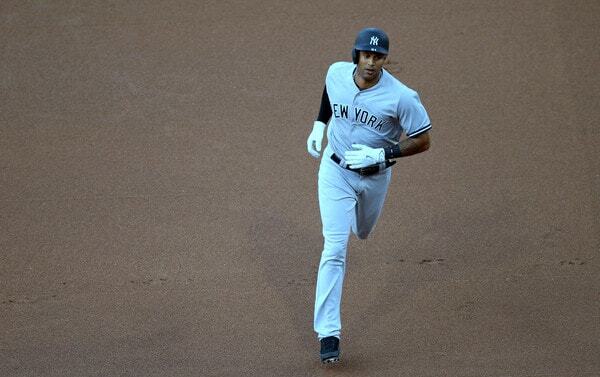 Stanton currently leads the Yankees in hits (103) and total bases (192), and is one point behind Miguel Andujar for the team lead in batting average, and he leads baseball in four-hit games, if you can believe that. He has five, Jose Altuve has four, and a bunch of dudes have three. Stanton has five four-hit games and the rest of the Yankees have five (Gardner has two and Andujar, Gregorius, and Gary Sanchez have one each). Furthermore, Stanton has handled the shift to left field about as well as I would’ve expected a player with zero experience at the position to handle it. He lost two balls in the sun in Spring Training in literally his first left field game and that seems to have led to the perception he is not a good defender, which is a flat out wrong. Is Stanton a Gold Glover in left? No, but he’s done well (+4 DRS if anyone cares) and he remains a strong defender in right. Based on what I’ve seen on social media and in our comments and in the media, I’ve come to the conclusion Stanton is A-Rod 2.0 in terms of how people feel about him. He is tolerated when he does well and lots of folks are ready to pounce and blame him for everything that goes wrong. Starting pitcher gets bombed? Stanton should’ve hit more homers. I felt it in Spring Training and I’ve seen nothing since then to convince me things will be different. Whatever. Expecting Stanton to repeat last year’s 59-homer effort was never fair or realistic — that was a top ten home run season all-time — though his slow start to the season was disappointing, especially at home, and fans let him hear it. It was dumb, but whatever. Giancarlo has been the Yankees’ best hitter since May 1st. He’s been hitting for average and power, and playing wherever the team needs. The slow start prevents him from getting an A in the first half. 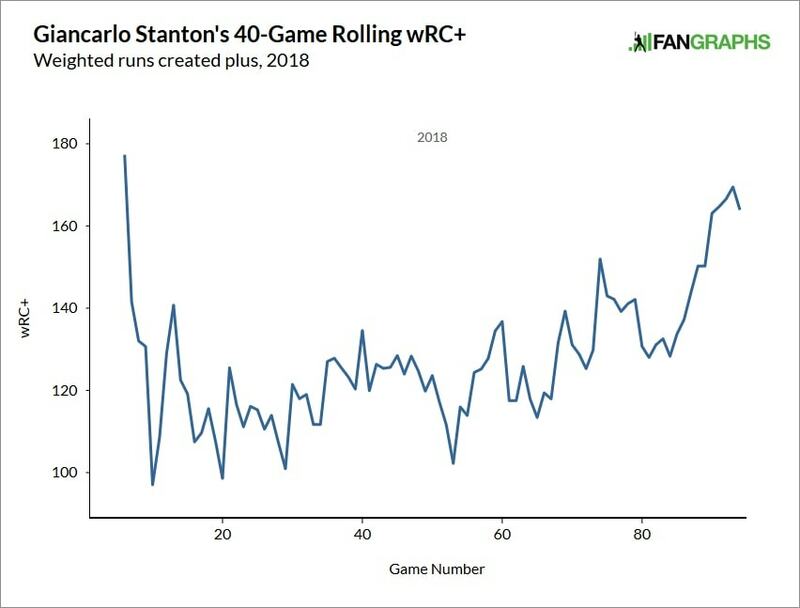 Otherwise Stanton’s been pretty great, and I’m looking forward to seeing what he does in the second half as he grows more comfortable with his new team. A large portion of the Yankees off-season was spent worrying about who would be manning the keystone and the hot corner. There was buzz, of course, that Gleyber Torres and Miguel Andujar would be given the keys eventually – but it seemed unlikely (at best) that the organization would be starting two rookies on Opening Day. 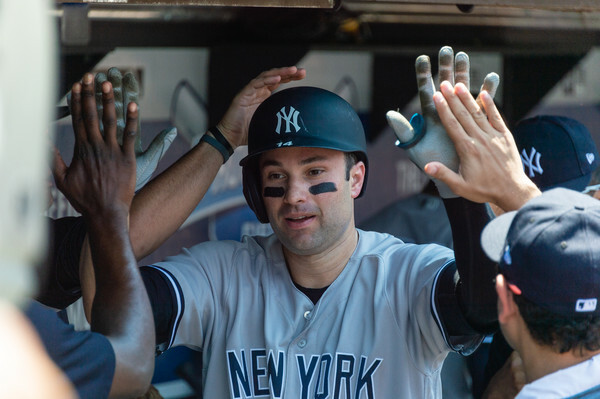 It wasn’t until late-February that they added a legitimate veteran option to the mix in Brandon Drury, and three weeks later Neil Walker was signed; and the short-term fates of Torres and Andujar felt sealed. Of course, nothing ever quite goes according to plan. Andujar is a bad defensive third baseman. Defensive metrics are notoriously fickle, particularly when small sample sizes are at issue, but Andujar ranks dead last among third basemen in DRS (-12) and UZR (-6.8), second to last in Total Zone, and third to last in FRAA. He’s sure-handed, as evidenced by his ranking 8th in converting routine plays at the position per Inside Edge fielding data – but he’s third to last in ‘likely’ plays, and last in plays with ‘even’ odds. And that matches the eye test. Andujar has had his ups and downs offensively, but it’s notable that he has posted a 98 (or better) wRC+ each month so far, and has avoided any prolonged slumps. And his walk rate might just bear watching, as he has worked a free pass in 10.3% of his July plate appearances, which does correspond with a small but noticeable dip in his swing percentage. There are three tremendous differences to be noted here (two of which are dependent upon each other): his grounders, his flyballs, and his pull percentage. Bird’s putting the ball on the ground way more, which naturally means that he’s getting the ball into the air less often, and he’s pulling the majority of his batted balls to the right side of the field. And, given that he hits against the shift quite often, that’s why he’s batting .059 on grounders … against a league-average of around .240. Some of that is undoubtedly luck, as well, but a lead-footed slugger pulling lots of balls into the teeth of the defense isn’t a great means to an end. Though, to be fair, his groundball percentage is lower than league-average – it’s simply higher than it should be for a hitter of his ilk (and trending in the wrong direction). On the plus side, Bird’s quality of contact is quite good. His soft-hit percentage is nearly eight percentage points better than average, and that difference is split between medium and hard contact, both of which are around four percentage points above-average. Put that all together, and his average exit velocity is 88.5 MPH, which is … well … average. All told, Bird is batting .214/.317/.457, which is good for a 109 wRC+. That puts him right in-line with the league-average first baseman, who’s batting .249/.331/.438 (108 wRC+). nd he posted a .281/.359/.625 slash line in his last nine games of the first-half, which works out to an average grade for me. 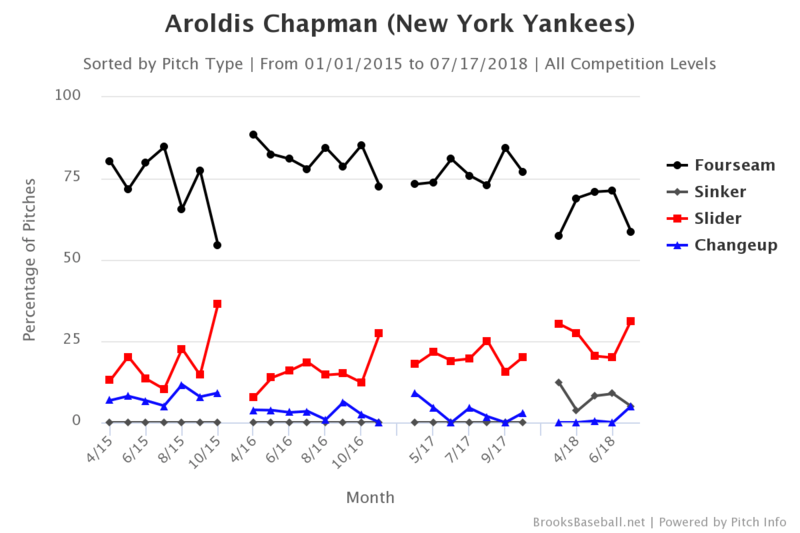 All of those lines are trending in the right direction, and work together to give us the best version of Gregorius to-date. It is interesting to note that he did walk at an above-average rate way back in 2013 with the Diamondbacks, and then developed an itchier trigger finger over time. Perhaps this is simply his final form. What otherwise stands out the most about his season thus far is his power. Those 15 bombs have come in 241 PA – or one every 16.1 PA. Torres hit 24 HR in the minors, across 1591 PA … or once every 66.3 PA. It isn’t uncommon for a player to develop more power over time, and the majority of his time in the minors was spent in pitcher’s parks – but most scouting reports saw him as a guy that could hit 15 to 20 home runs in a season. At his current pace, he would hit 40 home runs in a 650 PA season. That’s quite the difference. The top row represents Torres, and the bottom is league-average. 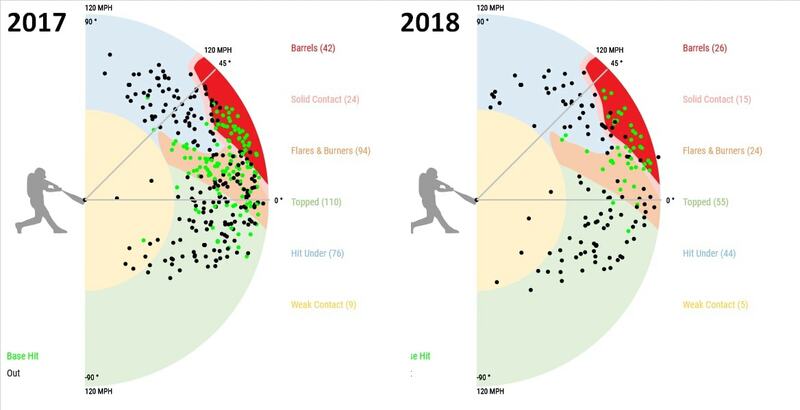 The short version: Torres swings more often at pitches in and out of the zone, and makes less contact than the average batter on pitches in and out of the zone. It is worth noting, however, that his swing percentage on pitches outside of the zone has been declining at a slow-and-steady pace. Defense has been a mixed bag for Torres, as well – but it’s kind of difficult for me to make much out of that. Heading into 2018, Torres had played just 18 games at second base, so he is essentially learning the position on the fly. Moreover, unlike Andujar, Torres has long drawn strong marks for his defense, with most believing that he could stick at shortstop long-term. And, also unlike Andujar, Torres’s defensive metrics are all over the place. DRS has him as a +2 defender, whereas UZR has him at -4.3. I’m confident that his defense isn’t a concern. I wanted to be cheeky and go with an F+ or a D-, but I simply couldn’t justify it. Walker is hitting .197/.278/.285, which translates to a 55 wRC+ … which ranks 248th among 258 hitters with at least 200 PA. And his -0.7 WAR is even worse, ranking 253rd among that same group of players. Saying that Walker has been bad is an understatement.
? There’s also the fact that he’s only making $4 MM, which is a veritable drop in the bucket. And he has – as far as we know – taken his utility role with quiet dignity and grace, playing 280.2 innings at first, 122.0 at second, and 42.0 at third. And you could always hold out hope that a player that was as good as Walker for so long couldn’t possibly be so bad all of the sudden … right? It seems likely that Walker would have been gone already if the Yankees didn’t have Bird, Drury, and Torres go down with injuries at different times, doesn’t it? And that means his time in pinstripes may be running out as Torres is slated to return shortly. 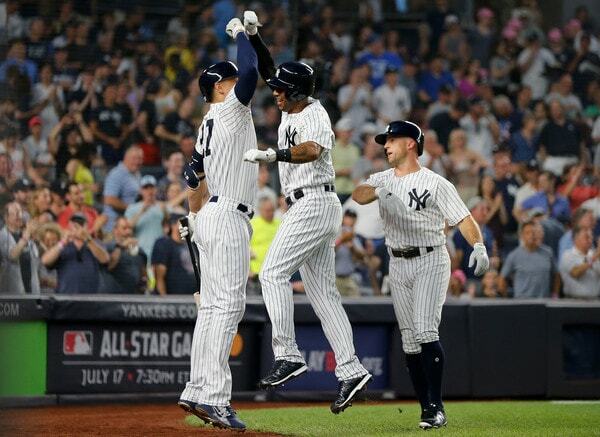 The All-Star break has arrived and this is the perfect time to take a step back and review the first half of what has been a very successful 2018 Yankees season to date. We’ll review the team and hand out some letter grades (relative to expectations), because why not? We begin today with the catchers. Coming into the 2018 season, the catcher position was expected to be a strength for the Yankees. Gary Sanchez established himself as one of the top backstops in baseball last season — certainly as the top power-hitting catcher, at the very least — and the expectation was he would again produce at that pace this year, if not improve. Instead, it’s another Yankees catcher who has improved this year. Let’s review the season to date behind the plate. We’re going through the players alphabetically and I suppose it’s fitting we begin with an incomplete grade. Season’s still far from over. Kyle Higashioka has been on the big league roster for less than a month as the backup catcher during Gary Sanchez’s disabled list stint. Higashioka was the No. 3 catcher on the depth chart coming into the season and he had to bide his time in Triple-A until an injury struck. Prior to the call-up, Higashioka authored a weak .191/.265/.328 (66 wRC+) batting line with five homers in 51 games with Triple-A Scranton. In eleven games with the Yankees he’s gone 5-for-30 (.167) with three home runs. His first three big league hits were dingers! Higashioka and Alfonso Soriano are the only players in franchise history to do that.
? Defensively, I’m not really sure what to say about a guy with 81 innings behind the plate. Runners are 9-for-9 stealing bases against him, which is terrible, though Baseball Prospectus (subs. req’d) says he’s been a slightly above-average pitch-framer, so that’s good? Better than the alternative, I suppose. Ultimately, Higashioka has been a perfectly cromulent backup backup catcher. Three dingers in 33 plate appearances is more offense than I would’ve expected from a third string catcher, and his receiving has been fine. (The stolen bases are another matter.) Higashioka’s been in the organization long enough that he knows the pitching staff fairly well. He’s been fine in his limited big league team. That’s a good way to describe it. Fine. He’s been fine. I’m not sure any player on the roster has exceeded expectations more than Austin Romine so far this season. Romine was legitimately bad the last two years. He hit .228/.271/.330 (57 wRC+) in 428 plate appearances from 2016-17 and, for what it’s worth, the Baseball Prospectus (subs. req’d) defensive numbers had him at +1.8 runs above average behind the plate, which is not nearly good enough to make up for the lack of offense. The defensive numbers are basically unchanged this year, but, for the first time in his big league career, Romine has been a legitimate threat at the plate. He currently owns a .270/.333/.492 (124 wRC+) batting line — a .492 slugging percentage! — with six home runs in 136 plate appearances. 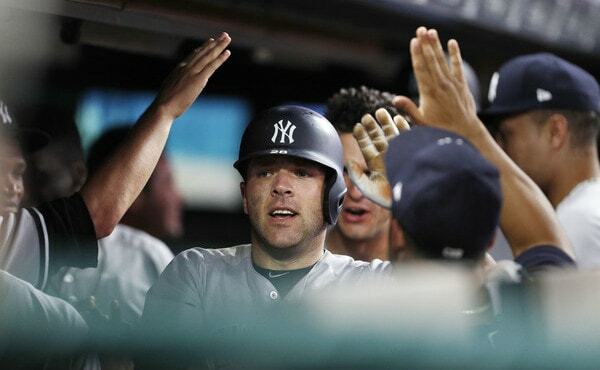 Romine hit seven home runs total in 611 career plate appearances prior to this season. Now he has six in 136 plate appearances. One on hand, we’re talking about 136 plate appearances spread across 95 team games. Context is important. On the other hand, Romine has never done anything like this before in his career. More hard contact, more balls in the air, more balls to the opposite field, fewer chases out of the zone. Pretty good combination there. The results are backed up by promising underlying trends. Will Romine continue at this pace all year? Who knows. Expecting him to maintain a 124 wRC+ the rest of the way might be asking too much. But there is enough underlying improvement here to think Romine now is a better hitter than he was the last two years. And, even if he reverts back to pre-2018 Romine, his first half already happened. These 136 awesome plate appearances happened and they’ve helped the Yankees win games. Even the biggest Austin Romine fans did not expect this. What a first half for the backup catcher. Relative to expectations, yes, this has been a very disappointing season for Gary Sanchez. And not just because of the groin injury that has sidelined him since June 25th. Prior to the injury Sanchez hit .190/.291/.433 (96 wRC+) with 14 home runs in 265 plate appearances, and his passed ball issues remain. Gary allowed one passed ball every 50.2 innings before the injury. The MLB average is one passed ball every 117.1 innings. Relative to big league catchers, Sanchez had a pretty good first half. I mean, a .190 batting average is a .190 batting average, and that’s terrible. But catchers are hitting .231/.305/.373 (85 wRC+) overall this season. Sanchez is in the ballpark with his OBP and his power is far better than pretty much everyone else. Gary hasn’t played in three weeks and he still leads all catchers with 14 home runs. The power has been his saving grace. Sanchez already has more batted balls near the 90° line than last season, and he has 44 “hit under” balls among 169 balls in play, or 26.0%. Last year he had 76 “hit under” balls among 355 balls in play, or 21.4%. Gary’s 21.1% infield fly ball rate — that’s 21.1% of all fly balls that are infield pop-ups — is far above last year’s 10.8% rate and far above the 10.3% league average. Totally matches the eye test in my opinion. So many pop-ups. So many. Gary did have some big moments in the first half. There was the walk-off homer against the Twins, and the go-ahead homer that had Ken Giles punching himself, and the game-tying homer against the Mariners. Believe it or not, Sanchez does have a 150 wRC+ in high-leverage spots and a 139 wRC+ with runners in scoring position this season. Even with the overall disappointment, Gary came through in some really big moments in the first half. The pop-ups and weak fly balls are really dragging down Sanchez’s batting average and overall production. I don’t know if he’s changed his hitting mechanics, gotten too home run happy, or fouled himself up trying to improve his launch angle, but whatever it is, it’s something Gary and the Yankees have to fix and soon. He’s expected back from his groin injury for the start of the second half Friday. The sooner good Gary returns, the better.